How to join a Medicare Advantage Plan? Medicare Advantage, or Medicare Part C, is a health plan that offers Medicare Part A, B and typically D benefits through a private company. Medicare Advantage essentially replaces Original Medicare offering better benefits and coverage options, but at a higher upfront cost than Original Medicare. The costs you pay upfront are meant to be offset by the greater cost coverage and benefits Medicare Advantage provides. Since Medicare Part A and Medicare Part B are always part of Medicare Advantage, and must offer at least the benefits offered by Original Medicare, you’ll never get less benefits than you would from Original Medicare. If you need coverage beyond Original Medicare you’ll want to shop for a Medigap or Medicare Advantage Plan. Both of these pair with Prescription Drug Plan (Part D), although Advantage Plans usually include drug coverage. Is Medicare Advantage Minimum Essential Coverage? Medicare Advantage (Medicare Part C) counts as minimum essential coverage under ObamaCare (the Affordable Care Act). If you have Medicare Part A (Hospital Insurance) or Medicare Part C (Medicare Advantage), you’re considered covered and won’t owe the fee for not having health insurance under ObamaCare. Is Medicare Advantage Part of ObamaCare? Medicare isn’t part of ObamaCare and that includes supplemental Medigap insurance and Medicare Advantage plans, so you won’t shop for your coverage through the marketplace. Instead you’ll want to following the instructions under the “how to sign up for Medicare Advantage” section below. The Affordable Care Act makes a number of changes to Medicare Advantage, but most are aimed at the health insurance industry rather than those with Advantage Plans. First off no benefits were cut from Advantage plans, in fact many Part A benefits that were previously subject to out-of-pocket costs are now “free”. ObamaCare also helps to close the Part D “donut hole”, so drug coverage is improved too. A major change specific to Advantage Plans is a requirement that Advantage plans cannot charge enrollees more than traditional Medicare for chemotherapy administration, skilled nursing home care and other specialized services. Starting in 2014, Medicare Advantage plans cannot spend more than 15 % of their Medicare payment on administrative costs, insurance company profits and non- healthcare related items. These cost cutting measures are estimated to bring in $1,000 in savings to CMS per Advantage Plan member without reducing any benefits. This is expected to help decrease Medicare part B payments, especially for low income seniors. Remember: Medicare Advantage Plans must provide at a minimum what Original Medicare covers. We break down Medicare Advantage and how it pairs with Medicare Part D and compares to Medigap insurance below, these are just some quick facts to help you understand Advantage Plans at a glance. You must already have Medicare Part A and Part B to be eligible for a Medigap policy. When you get an Advantage Plan you’ll get your Medicare Part A (Hospital Insurance) and Medicare Part B (Medical Insurance) coverage from the Medicare Advantage Plan and not Original Medicare. With Medicare Advantage you usually pay a monthly premium (in addition to your Part B premium). However all claims are paid from your Advantage Plan. Advantage plans come at a higher upfront cost than Original Medicare, but typically pay a higher percentage of claims and offer better benefits and drug coverage. Medicare pays a fixed amount for your care each month to the companies offering Medicare Advantage Plans. These companies must follow rules set by Medicare. Medicare Advantage Plans usually include Medicare Part D (Prescription Drug Coverage), but not every plan does. You’ll need to shop for the right advantage plan for your specific needs. It is possible to have a Medicare Advantage Part C plan and a Medicare Prescription Drug Coverage Part D plan, if your Advantage Plan doesn’t include drug coverage. In regards to Medicare, only Medicare Part A (hospital insurance) and Medicare Part C (Medicare Advantage) count as minimum essential coverage. If you have minimum essential coverage you won’t owe the fee for not having health insurance. The best time to buy a Medicare Advantage policy and or Part D drug coverage is during your initial Medicare Enrollment Period (see details below). Every year there are two open enrollment periods where you can make changes to your Advantage and Part D plans. 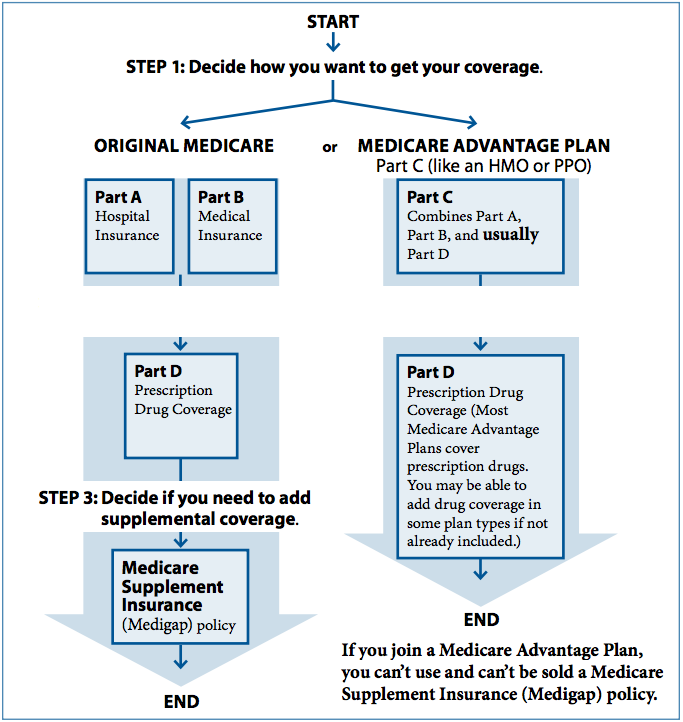 Medicare Advantage (Part C) essentially replaces Original Medicare (Part A and Part B). When you choose a Medicare Advantage Plan your Medicare services are paid for by your Advantage Plan instead of Original Medicare (although you’ll still pay your Part B premium on-top of your new Part C premium). Medicare Advantage Plans typically offer better coverage options, typically including prescription drug (Medicare Part D), and always include at least the benefits offered by Part A and Part B.
Medicare offers less upfront costs and benefits, but less coverage options and greater out of pocket costs. You can get a full breakdown of the differences from this quick PDF from medicarerights.org. What Does Medicare Advantage Cost? To be eligible for a Medicare Advantage (Medicare Part C) you must have Medicare Part A and Part B and live in the plan’s service area. If you only have Part A you will become eligible for Part C when you join part B. At this point you will have a 60 day initial enrollment period (see below) to switch to an Advantage plan. Please note that people with End-Stage Renal Disease (permanent kidney failure) generally can’t join a Medicare Advantage Plan. Should I Get an Advantage Plan? Seniors whose medical costs and needs aren’t adequately covered by Original Medicare usually supplement their plans with Medigap, Prescription Drug Coverage (Medicare Part D), or Medicare Advantage (Medicare Part C). The supplemental insurance you choose should be based on your specific medical needs. Any broker, agent, or provider authorized to sell supplemental Medicare plans can help you choose the right plan for you, but be aware that different insurers can charge different amounts for the same coverage so you’ll always want to shop around before buying. Please note you cannot have Medigap insurance and an Advantage Plan at the same time. However you can pair Part D with a Medigap policy or with an Advantage Plan that doesn’t offer Part D coverage. Does Medicare Advantage Cost More Than Medicare? Medicare Advantage will typically come at a higher premium price than Original Medicare and will be paid for on-top of your Part B premium. This cost is meant to be offset by your actual annual medical claims and the additional benefits offered by the Advantage Plan. Should I Get Medicare Advantage or Medigap? The end result of getting a Medicare Advantage Plan and piecing together your own Medicare plan by picking up a supplemental Medigap policy and/or Prescription Drug Coverage under Medicare Part D are pretty similar. The benefit over one avenue or another depends on your specific medical needs and projected medical costs weighted against available plans in your area. Can I Have Medicare Advantage and Medigap? Medigap policies can’t work with Medicare Advantage Plans. Although you can switch from one to the other you can’t have both at the same time. They can both pair with Part D drug coverage, although most Advantage Plans offer Part D as part of their package. Your Medicare Advantage Plan essentially replaces Original Medicare, meaning instead of Medicare paying it’s share of your claims Medicare pays the private insurance company and that company then pays it’s share of your claims as dictated by your plan. Please note you will still owe your Part B premium every month, your Part C premium will be paid separately. What Doesn’t Medicare Advantage Cover? Your Medicare Advantage Plan coverage depends upon what plan you choose. Does Medicare Advantage Cover Prescription Drugs? Medicare Advantage Plans almost always cover prescription drugs by including at least the benefits of Medicare Part D as part of your Advantage Plan. If your plan doesn’t offer drug coverage you can join a Medicare Prescription Drug Plan, but be aware you can’t have prescription drug coverage through both a Medicare Advantage Plan and a Medicare Prescription Drug Plan. If you choose a plan that doesn’t offer drug coverage and want drug coverage down the line it will usually make more sense to switch to a different Advantage Plan or to switch to a Medigap plan and then sign up for Part D as well. Unlike Original Medicare there are a few different types of Medicare Advantage Plans to choose from. The most common plans are Health Maintenance Organizations (HMO) and Preferred Provider Organizations (PPO) plans, but there are a few other options that you should know about. They are Health Maintenance Organizations, Preferred Provider Organizations, Private Fee-for-Service Plans, Special Needs Plans, and Medicare Medical Savings Account Plans. Let’s take a look at these different basic plan types to get an idea of what each one can do for you. Medicare Advantage HMO Plans: In an Health Maintenance Organizations (HMO) plan you can only go to doctors, other health care providers, or hospitals on the plan’s list except in an emergency. You may also need to get a referral from your primary care doctor. You can learn more about HMO plans at Medicare.gov. Medicare Advantage PPO Plans: In a Preferred Provider Organization (PPO) Plan, you pay less if you use doctors, hospitals, and other health care providers that belong to the plan’s network . You pay more if you use doctors, hospitals, and providers outside of the network. You can learn more about PPO plans at Medicare.gov. Medicare Advantage PFFS Plans: In a Private Fee-for-Service (PFFS) Plan, the plan determines how much it will pay doctors, other health care providers, and hospitals, and how much you must pay when you get care. You can learn more about PFFS plans at Medicare.gov. Medicare Advantage SNP Plans: Medicare SNPs limit membership to people with specific diseases or characteristics, and tailor their benefits, provider choices, and drug formularies to best meet the specific needs of the groups they serve. You can learn more about SNP plans at Medicare.gov. Each of these plan types offers a number of different options. For instance a number of insurers may offer different PPO plans with different types of costs and coverage in your area. Your initial Medicare Advantage enrollment period is 3 months before, the month during, and the month after you turn 65. There are a number of special enrollment periods discussed below as well. When you first become eligible for Medicare or when you turn 65, during your Initial Enrollment Period. This includes 3 months before you turn 65, the month you turn 65, and 3 months after. The period is extended for those who qualify for Medicare due to disability. During certain enrollment periods that happen each year. a) Between April 1–June 30 of each year you are eligible to switch to a Medicare Prescription Drug Plan (Part D) if you don’t have Part A and you enroll in Part B during the January 1–March 31 general enrollment period. b) Between April 1–June 30 of each year you are eligible to switch to a Medicare Advantage Plan (Part C) if you have Part A and you enroll in Part B during the January 1–March 31 general enrollment period. You qualify for Extra Help with Medicare prescription drug costs. You’re getting care in an institution, like a skilled nursing facility or longterm care hospital. Please note there is a late enrollment penalty added to your Part D premium for the duration of your coverage if there is a period of 63 days in a row where you don’t have Part D or any other creditable prescription drug coverage after your initial enrollment period. See this Medicare Advantage Open Enrollment PDF from Medicare.gov for more Medicare Advantage open enrollment and sign up information. The open enrollment periods for Medicare Advantage are January 1–February 14 and October 15–December 7. During this time you can change your Advantage Plan or Part D drug plan. Open enrollment periods are not the same as your initial Medicare enrollment period discussed above. See the table below for the specifics of each enrollment period. If you’re in a Medicare Advantage Plan, you can leave your plan and switch to Original Medicare. Your Original Medicare coverage will begin the first day of the following month. If you switch to Original Medicare during this period, you will have until February 14 to also join a Medicare Prescription Drug Plan to add drug coverage. Your prescription drug coverage will begin the first day of the month after the plan gets your enrollment form. Join, switch, or drop a Medicare Medical Savings Account Plan. First make sure you qualify for Original Medicare, you’ll need to enroll in Parts A and B to be eligible for an Advantage Plan. To sign up for Original Medicare go to the Medicare.gov. Make the choice between Medicare Advantage and a Medigap Plan. Medigap plans supplement your original Medicare plan while an Advantage Plan effectively replaces it. Once you decide what direction you want to go with your supplemental Medicare insurance you’ll want to find a broker, agent or provider authorized to sell Medicare Advantage Plans to help you choose the right plan for you based off your specific needs. Remember you’ll want to check out your Medigap policy options and ensure your plan covers Part D if you’ll need drug coverage. Choosing the right Medicare Advantage plan depends upon your medical needs and costs. As a general statement you’ll want a plan that covers your known needs and projected needs at a cost that will result in lower total costs than original Medicare. Make sure to choose a plan that includes drug coverage if you need it and a network that includes any doctors or services you know you’ll need. Should I Get Medicare Advantage? Whether or not Medicare Advantage makes sense for you depends upon your intentions and specific situation. In many cases Medicare Advantage will make sense if your total annual costs will be reduced with an Advantage Plan over an Original Medicare plan. Remember you can always call any broker, agent or provider authorized to sell these plans and have them help you through the process.